Bonus Episode: Birthdays and Patreons! In this special bonus episode, Rosie and Jessica celebrate four years of podcasting and announce their Patreon campaign! After four years of podcasting, we’re launching this so you can support the show with a monthly subscription. We’ve got goals to hit, including live events and shiny shiny badges, but more importantly we’ve got some lovely rewards for our supporters, from shout outs to exclusive bonus episodes. And even if you don’t subscribe, Rosie and Jessica’s Day of Fun will always be free to listen to! 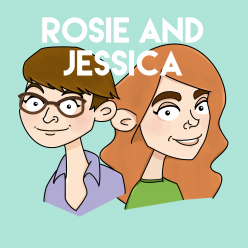 You can support Rosie and Jessica’s Day of Fun by being a Patron, by buying things with our faces on, and by sharing our episodes with your friends or even casual acquaintances.